Nice walking routes are nearby Nupar and a horse rental is in the area. There are only 3 km. to Hveragerdi. In Hveragerdi you can get all the services you need. 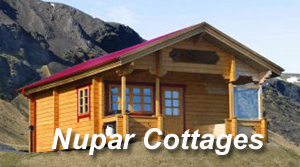 Pets are not allowed at Nupar and no smoking applies to all of the cottages. Sögusetrið Njálu hvolsvelli- 63,4 km or 49 min drive Gullfoss og Geysir- 81,8 km or 59 min drive Dyrholaey Vík- 138 km or 1 kl and 50 min drive.